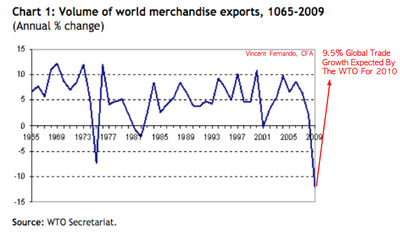 The collapse in global trade has in retrospect been very short-lived. Sure we saw one of the worst contractions in long time during the recent financial crisis, but now it’s all coming back. For example, the World Trade organisation expects global trade growth to be in the range of 9.5% this year. Without any further upheavals in the global economy, world merchandise trade should resume its normal upward trajectory through the end of 2010, although some deviation from its previous trend line will persist indefinitely. The WTO Secretariat estimates that world exports in volume terms will grow by 9.5%, this year, while developed economies’ exports will expand 7.5% and the rest of the world (developing economies plus the Commonwealth of Independent States) will advance 11%. So much for the world’s economic model being proven ‘wrong’ during the crisis. In the future, we’ll look back on the collapse above as a blip. 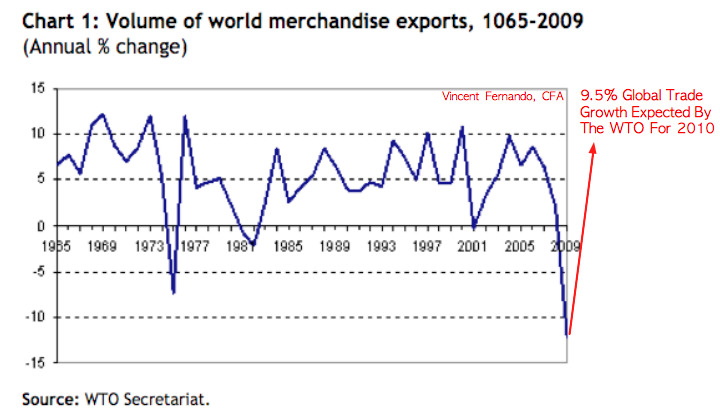 So get exposed to world trade in any prudent way you can, it’s already staging an impressive rebound and that’s with just the weak global recovery we have right now.